"A wallet, or billfold, is a small, flat case that is used to carry personal items such as cash, credit cards, identification documents (driver's license, identification card, club card, etc. ), photographs, gift cards, business cards and other paper or laminated cards. Wallets are generally made of leather or fabrics, and they are usually pocket-sized but not always foldable"
This means that there are many different wallet types available, i.e. targeting different needs and people. The different wallet types reflect our different needs and wishes to carry our valuables with us. Credit card wallet is ideal for those that prefer to carry only cards on them. Others may prefer money clip wallet, coin wallet or even checkbook wallet. You may want the wallet to be foldable. Then you can choose between bifold and trifold wallet. Most men prefer small wallets that fit in the back or breast pocket. Women usually carry their wallets in their handbag. Women wallets therefore tend to come in more shapes and sizes, i.e. to fit in different sized handbags. There are though more ways to carry a wallet. There is clutch wallet that can be carried by hand, wallet on a string that is carried on the shoulder, neck wallets, wrist wallets, waist wallet, and even belt wallets. There is also the material to consider. Leather wallets are always popular but they are by far the only option you have. There are cool nylon wallets, lightweight aluminum wallet, stainless steel wallet, waterproof wallets, etc. Then there are special wallets for travelers, like passport wallet and RFID wallet. We have listed the different types of wallets in the following table. 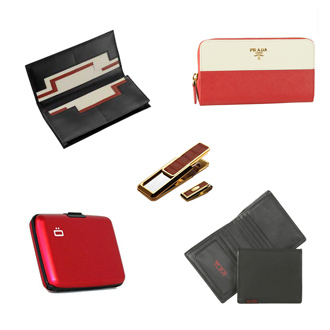 Just click on the wallet type you are interested in to view that particular wallet collection. There is a short description to help you to decide if this wallet type is of interest to you or not. Most of the wallet types are suitable for either sexes but some target men or women specifically (as indicated in the table). We hope this helps you to find the right wallet type for your valuables. You may also want to check out these B for Bag favourite wallets!